Wow another week has gone by and of course another scrap map at CCW. this time the theme is easter so anything eastery will fit this challenge. 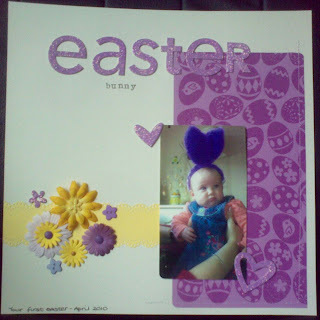 This is a picture of Poppy's first easter and as she is wearing purple easter bunny ears I have used the yellow and purple to co-ordinate with the theme. I have even got the sewing machine on this LO too. Love those bunny ears,she looks so cute. Fab page. Aww how cute does Poppy look in those ears? A lovely page, Lou. So cute! Nice page Lou - you are very brave sewing on your layouts!